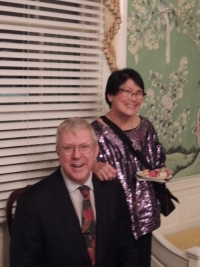 Friday, November 16 Bart and Lorraine joined the guests as Governor Phil Murphy and his wife Tammy as they opened the doors of their Drumthwacket residence to celebrate Governor’s Cup Garden State Wine Awards. ‘Twas a glorious opportunity to celebrate & sample New Jersey’s exploding, world class wine industry, and for Bart & Lo to meet so many old friends they made in authoring The Garden State Wineries Guide. 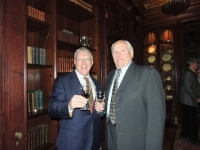 Bart & Garry Pavlis NJ’s Prime Wine Judge and Guru toast the state’s winery explosion – now up to 50. 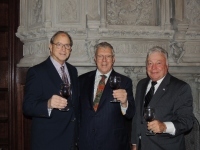 Gary, who penned the forward for The Garden State Wineries Guide, runs tours statewide. NJ Secretary of Agriculture Doug Fisher (left) and Bart prepare a bottle swap of their own homegrown wines. Bart & Lorraine enjoy Drumthwacket’s gubernatorial hospitality, and celebrate The Governor’s Cup Awards with many wine-making friends. – The sedentary administrator who gives her Fit Bit to her son working on the floor of a large warehouse, so she can impress her coworkers with her 25,000 steps a day, after he returns it to her. – The young brokerage firm trader who brings his family finances to work and labors on them after hours in his office so he can appear to be always staying and working late. – The CPA who photoshopped her face over that of a skier who was plunging down Winter Park’s toughest black diamond slope. She then hung this action shot casually in her office – ironically, beneath her framed diploma. Today’s business community is mantling on the attractive armor of hope, humanity, fun, downright silliness, and sincere concern for social contribution. Says who? 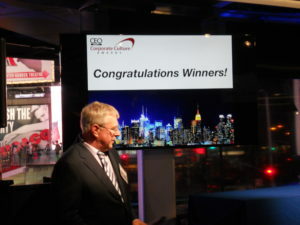 Says Bart Jackson and anyone who witnessed CEO Report’s latest Corporate Culture Awards held this January 24th at (appropriately)Times Square’s newest entertainment theme park, the NFL Experience. The Corporate Culture Awards are the brainchild of CEO Report, a broad-reaching, multi-media informational resource, recently risen from the ashes of Smart CEO Magazine. Under guiding hand of veteran publisher and CEO Jim McDonald, CEO Report is employing all media tools currently on deck to keep business leaders informed about what is working and who’s doing it the most effectively. Lilien Perito, master of development for the firm’s NY – NJ – CT region, deftly engineered this spirited soiree. The 24 selected award winners were mostly mid-size companies, each with a substantial number employees. All guests and company teams lustily entered into the evening’s NFL experience – testing our blocking ability, passing accuracy, play calling strategy, and pass-catching jump height compared with the pros. All great fun. Then, with dinner, came the real professional lesson as Lilie, with video and verbal profiles, presented the awards. With leaders a slight bit on the younger side, the winners came from all facets of commerce and industry. Investment houses Star Capital and Summit Place Financial, took honors alongside technology builders Wayside, Lorven, and bcm one, plus companies that restored your body (Spear physical therapy) and property (Maxons Restorations). As each award was presented, great cheers went up, the CEO rose invariably tugging several members of their firm to join in accepting the award. As the videos and the spirit of the evening demonstrated so boisterously, these are companies people where love to work. Enjoyment and engagement and teamwork are paid far more than lip service. Employee birthdays and project completions are lavishly celebrated; games are routinely played; fun family parties are standard parts of the work routine. The whole hall was enthused with the feeling that the daily workday must be a gathering of congenial folks blending fun and excitement in the quest for profit. Who says striving for achievement must be accomplished with a grim scowl? Certainly not the high-success teams honored at the NFL Experience on Wednesday. I left CEO Report’s joyous dinner with a broad smile and a lesson: If you want to attract and get the best production from the top talent, salary alone is no longer enough. You’d better ladle out some heavy doses of humanity and re-creation into your motivational mix – and never forget that all business is very personal.